story of Johann and Maria Janzen's family who settled in Kansas in the 1880’s. Their letters, describing life in the new world, were written to relatives in West Prussia, and are paired with the artist’s photographs of the places they left, now 21st century Poland. Text and photos were printed by the artist on newsprint, using an1880’s Babcock Reliance newspaper press in Peabody, Kansas, the town where Johann and Maria Janzen and family arrived by train in 1880. Multiple pages of this “newspaper” are collaged together and combined with toner transfer, photopolymer relief plates, and gouache additions. 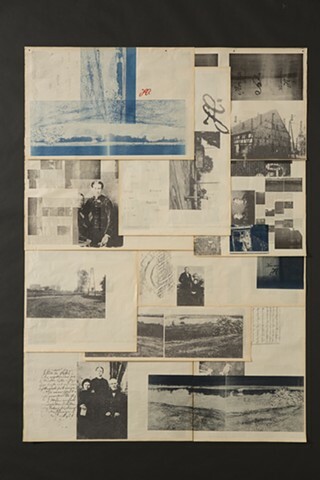 Combining contemporary imaging techniques with antique technology and historical text, the artist creates a visual and conceptual dialog across time, culture, and geography.